Today, we consider time to be one of our most important assets, which explains the explosion in the popularity of meal delivery services. We want delicious, home-cooked meals, but we don’t want to take the time to do the research or pick up the right groceries. So why should getting your weed be any different? That’s the idea behind a new California start-up called Lucky Box Club. It’s a hand-crafted, farm-to-lung experience. When you sign up for Lucky Box, you fill out a quick intake questionnaire, and just as food delivery services can accommodate different dietary restrictions, Lucky Box can cater to your weedy preference. Only want bud? Bud is all you’ll get. You can also choose edibles-only, concentrates-only, CBD-only, or any combination. You can also state whether you prefer lively sativa, mellow indica, or hybrid strains. That will go in your profile, so every month you’ll only be getting stuff you like and are liable to use, and they’ll even try to make sure that dosages are aligned with your tolerance levels, but pro-tip: Always start off teeny-tiny with new edibles. There are two levels of boxes: The Classic and the Executive. Say you wanted a Classic box with just bud. For $100 a month, your box will come loaded with four 1/8ths (a half-ounce total) of top-quality flower in varieties that will suit your tastes, along with some accessories such as branded lighters, rolling papers, some bonus pre-rolled joints, and quite possibly an edible like Medicine Box dark chocolate truffles or a Kin Slip sublingual (something like a strip or lozenge that you put under your tongue and let dissolve). You may even get extra lucky with a bonus vape pen from a company like Pure Vape. You end up getting a lot more than you would if you were going to a dispensary and buying each item individually. The Executive Box (pricing to be announced) follows the same model, but packs even more into the box. 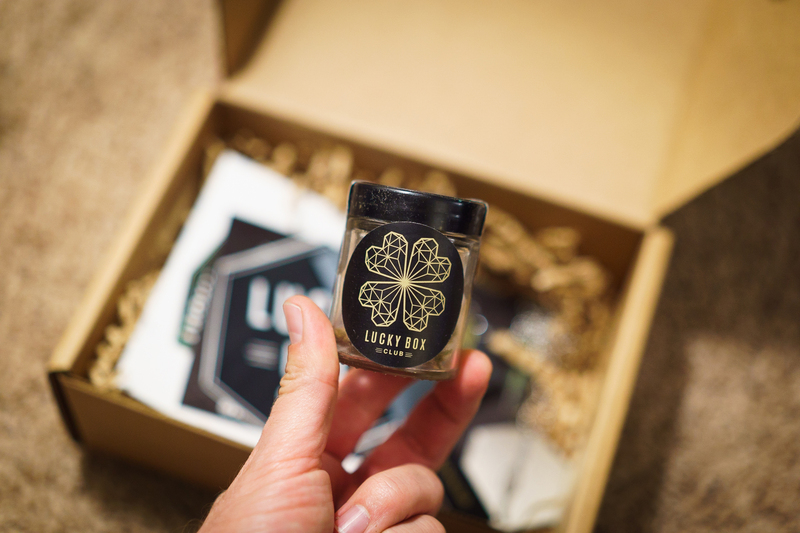 In the last year alone, Lucky Box’s in-house buyers attended more than twelve large cannabis events, where they were given hundreds of samples of products from growers, bakers, and other cannabis companies. They’re also constantly sent samples to try. Once they’ve narrowed it down a bit, the company throws literal potlucks, where trusted friends are invited to sample and review the products. Each person fills out a form giving a detailed review of each thing they try. Only the best-reviewed stuff will make it into a box. Having tested a Lucky Box myself, I have to say I was extremely impressed with the quality of goodies in it. I told them I wanted a little bit of everything, and they delivered. My box contained an eighth of a lovely hybrid bud called Tangie Kush, three pre-rolled joints of an indica called Blueberry, a yellow glob of sativa concentrate called Blue Berry Lemonade, a disposable indica vape pen, and a small jar of cannabis body cream. 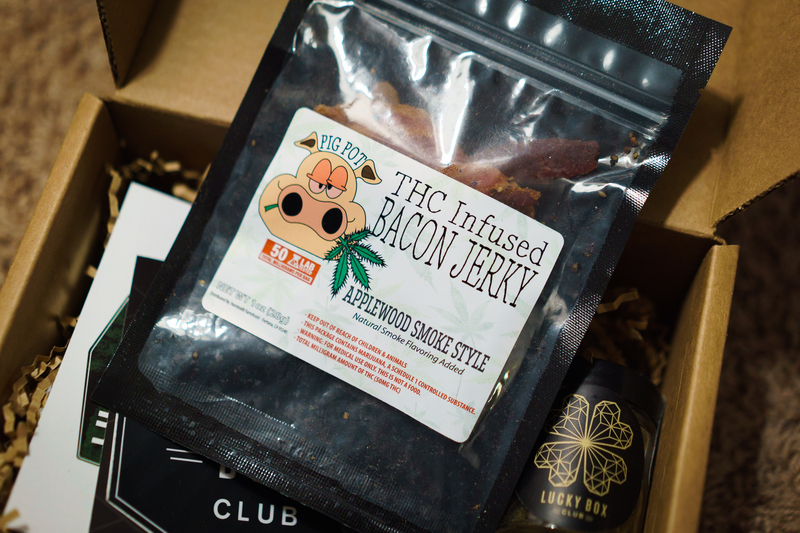 The highlight, though, was the bag of THC-infused bacon jerky, which tasted surprisingly great and packed a wallop. I have several friends who are school teachers that like to indulge from time to time but who are afraid to walk into a dispensary for fear that they might run into a parent (or a student) on their way out the door. Ditto for some friends in corporate life who have uptight bosses. For them, the idea that a month’s supply of high-quality marijuana can arrive through the mail in a perfectly discreet box is a real game-changer. It’s also just convenient as hell. If you’ve ever walked into a dispensary in California, it’s not uncommon to find yourself with more than 50 options for bud and another 50 or more types of edibles, concentrates, and other sundry products. It’s overwhelming, especially for newbies. Even seasoned vets will find strains they’ve never heard of, and most dispensaries don’t allow you to pull out your phone so you can look them up. With a service like Lucky Box, they’ve already done the homework, tried it out, and you know that it’s met their standards and is likely to deliver a good experience, which is all most people want. Here’s the catch: While recreational marijuana became legal in California as of January 1, 2018, some counties have opted out. At launch, Lucky Box will only be available to deliver to Los Angeles, the San Francisco Bay Area, and Sacramento, but they are hoping to expand rapidly. They are currently on pause while they file all the paperwork to make sure they are in full compliance with California laws, but they expect to start shipping boxes again in the spring of 2018. Currently, subscribers need a medical marijuana card to receive a Lucky Box, but starting the first week of May, Lucky Box says it will be serving anyone in California who is 21 or older and living in the counties where they deliver. So if you’re in those areas and you’ve always dreamed of having a curated, customized, high-end pot delivery service, well, May 1 is your lucky day.